Of course Manhattan has incredible restaurants, but I'd rather sink my teeth into Brooklyn any day. With all the choices "the city" offers, I think people tend to go with what's comfortable and choose a few favorites over and over and over again. My parents talked of two: "21" (not the 21 Club, mind you, but Hop Kee, a basement den with fluorescent lights at 21 Mott Street in Chinatown) and Viand, the pint sized diner where they ate amazing bagels with cream cheese and jelly near their apartment on East 63rd Street. I lived on the Upper East Side when I first moved to New York in 2000. I go up there now and all culinary memories of my two years there disappear. There was a dirt cheap dumpling shop (don't remember the name) and a few chains, but everything else is a blur. Next came the East Village and all that comes to mind is the meaty borsht from Veselka, pizza from Two Boots and goat cheese salad from 7A (all of which have very good food and very limited ambiance). There are thousands of cute places in that neighborhood - many relatively new - but somehow I never bothered to pop in. But then I moved to Williamsburg, the neighborhood where everyone's a waif and you can eat yourself into a local food coma. Porter and I rotate ourselves through these joints and love them all dearly. Click on the eating/drinking sidebar for more info about these places. They're really so, so good. (And I pray that someone can read that itty bitty map - it took ages to create). Note, I have omitted Egg (on purpose). It's delicious and cute, but all the great reviews have made the lines ridiculous. You don't come to Brooklyn to stand around. Hey! I just found your blog from The English Muse. I had seen it passed around a few places before, but never seemed to drop by. I just thought I should drop you a note to say that I really admire your work. Your photography is stunning. I love your polaroids. I am very envious of your skill! I'm totally with you. After years in Williamsburg we now live in Carroll Gardens ("restaurant row"? puh-LEEZ. yawn). 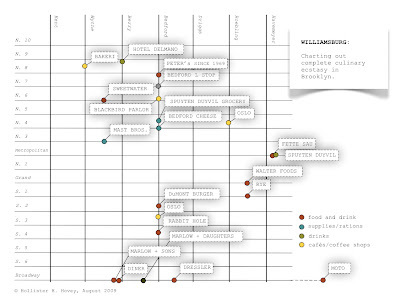 I continuously champion Williamsburg as the place to go for all things culinary. I like this map, but I'm surprised you didn't include Roebling Tea Room. We go to brunch at Roebling Tea Room quite often, but the service is just so spotty. We went for dinner the other night. Porter had to saw through her steak and my chicken was butchered so wildly that I spent about 20 minutes picking out tiny bones. But brunch there TASTES great and the space is wonderful. Fantast. But Fette Sau should be between Roebling and Hav. The leftover pork shoulder I am passing off as proper breakfast takes offense. Oh, Christ! I practically live at Fette Sau. How could I get that wrong? Will have to do a version 2 that's actually accurate. My goodness. Ah, my kind of post! I'll have to leave the island one day and wander through your hood. My experience there so far has been limited to the Bedford Cheese Shop and that store Whisk, so I've got lots of exploring to do! this is so great. i live in LA but whenever i visit new york i stay in williamsburg and always end up at dumont. i LOVE dumont, but i need to broaden my palate when i visit next month. thanks for this! gahhhhh HOP KEE> I just got horribly hungry. This will come in mighty good use! Thank you ladies ever so much!